Standard models predict that the composition of the public and private sectors’ balance sheets should have no effect on equilibrium prices or quantities. This view was put forward strongly by Eggertsson and Woodford (2003) in what can be viewed as an extension of a classic neutrality result shown by Wallace (1981). Arguably one reason why there has been little research on the optimal use of QE is that there has been (relatively) little work on the theory of how it actually works. Before QE was adopted in response to the global financial crisis, central bankers thought that it might work in several ways (see, for example, Bernanke, Reinhart and Sack, 2004). Similarly, when discussing the MPC’s 2009 QE programme, Benford, Berry, Nikolov, Robson and Young (2009) highlighted three distinct channels through which it might work. One of these channels is the so-called “portfolio balance mechanism”. This approach has a long and distinguished history, dating get back to the work of James Tobin and Bill Brainard among others. It asserts that different assets are imperfect substitutes because they each possess different non-pecuniary qualities that are valued by asset holders. This imperfect substitutability means that shifts in portfolio positions can generate changes in the relative yields on different asset classes. This suggests that purchasing assets from the private sector would increase the price of those assets (as they become in relatively short supply compared to the original demand for them). 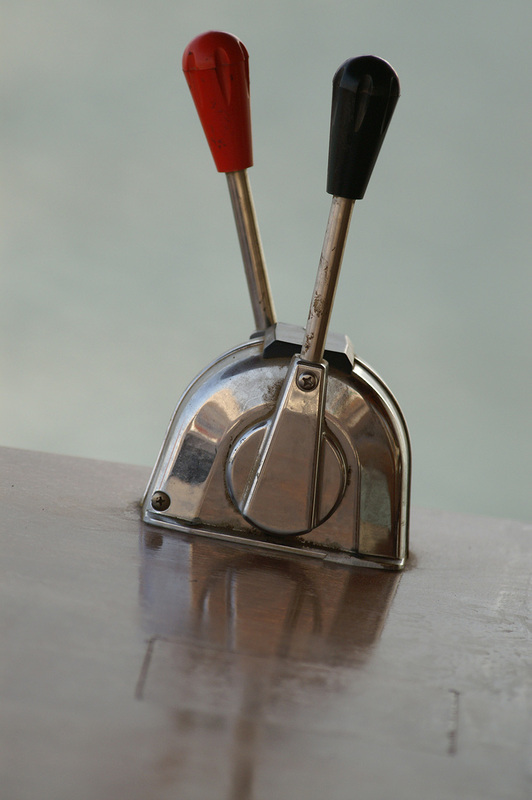 Asset holders receiving money in exchange for their assets would respond by reallocating their portfolios: by buying other assets, bidding up their prices too. The effects on other asset prices predicted by the portfolio balance mechanism seems to be in line with the empirical evidence, including D’Amico and King, (2013), Greenwood and Vayanos (2010, 2014), Joyce, Lasaosa, Stephens and Tong (2011) and Krishnamurthy and Vissing-Jorgensen (2012) among many others. And an apparent consensus formed among policymakers that QE works via this type of portfolio rebalancing mechanism (for example, Bernanke, 2010). To provide a role for QE, I extend a canonical, textbook New Keynesian model to incorporate imperfect substitutability between long-term and short-term government bonds. This is implemented by assuming that bond holders face costs of adjusting their bond portfolios, but is also consistent with preference-based microfoundations. I use the model to study how QE should be optimally used alongside the short-term policy rate when both instruments may be constrained. The short-term policy rate is constrained by an effective lower bound (ELB). The quantity of long-term government debt purchased by the central bank cannot be negative or exceed a pre-specified upper bound. This upper bound can be interpreted as a proxy for central bank solvency concerns as indicated by some monetary policymakers. I assume that the monetary policymaker is unable to make credible promises about future policy actions: policy is ‘time consistent’. In particular, it is not possible to stimulate the economy today by promising loose monetary policy in the future. The model is solved using methods that account for the non-linearities induced by the bounds on the policy instruments. It is calibrated to match evidence on the effects of QE in the United States. I study the properties of optimal monetary policy as the economy approaches and leaves the ELB. I also consider the extent to which a large central bank balance sheet in normal times may be desirable. This result stems from two features of the model. First, QE and the short-term policy rate both affect the economy only via their effect on aggregate demand. Second, using QE imposes costs on bond holders whereas there are no such costs associated with the policy rate. Taken together these features imply that if the monetary policymaker is able to set the desired monetary policy stance using the policy rate alone, then it will do so. When the policy rate is constrained by the ELB, the benefits of higher output and inflation from QE may offset the direct welfare costs of portfolio distortion. So the policymaker uses QE when constrained by the ELB. This result follows from the assumption that investors incur costs of changing their portfolio mix (between short and long bonds). This type of adjustment cost is required to achieve a good match to the effects of QE on bond yields in the data. Figure 1 illustrates a gradual unwinding of QE during a recovery from a recessionary shock. This is a corollary of Result 1. As soon as it is time to tighten policy as the economy recovers from a recession, it is best to start tightening by unwinding QE because that instrument imposes costs on bond holders, whereas conventional monetary policy does not. Results 1 and 2 are both consistent with observed behaviour and communications about exit plans by policymakers in the United Kingdom and United States. But Result 3 seems to contrast with the observed behaviour of both the FOMC and the MPC: liftoff has preceded a QE unwind. However, in the model, the QE policy instrument is the share of long-term government debt held by the central bank, rather than the nominal value of the bonds held by the central bank. 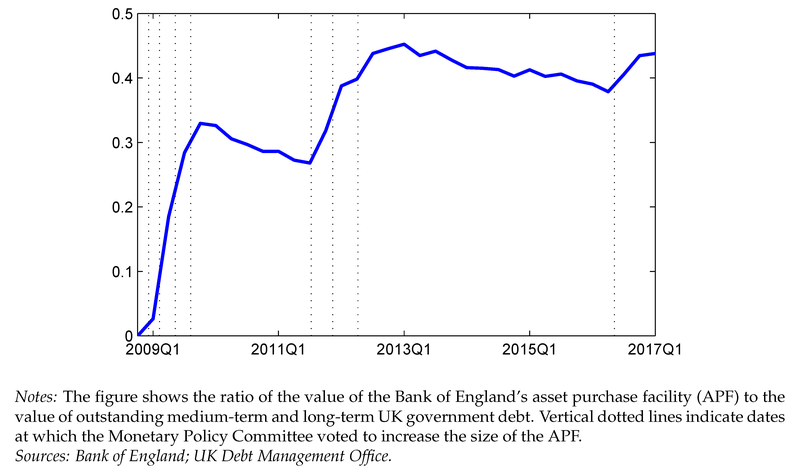 Figure 2 plots a crude approximation of this fraction for the UK: it rises following MPC decisions to increase the APF (vertical lines); but during periods in which the APF was constant and government debt rose, the share is often declining. On this measure, the ‘stance’ of QE was tightening from mid-2013 until the August 2016 policy package reversed that trend. So Result 3 also seems consistent with real-world policy behaviour. QE as conventional policy in future? 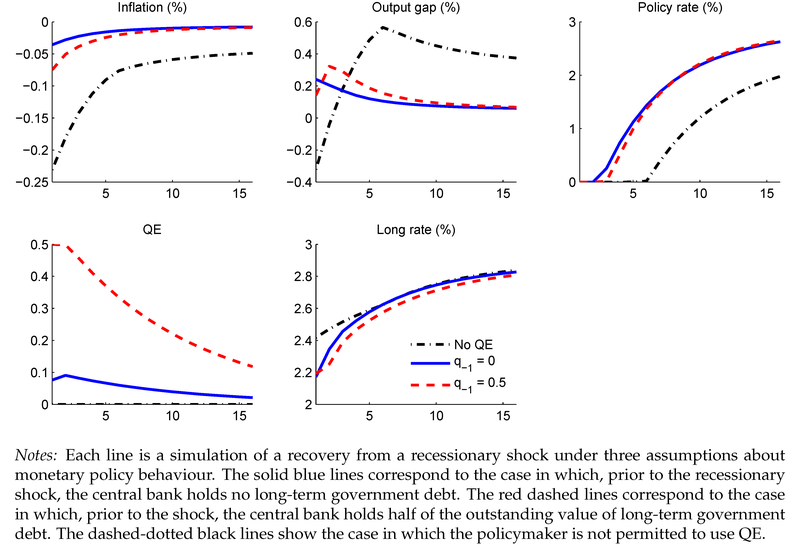 The paper demonstrates that, unsurprisingly, allowing the monetary policymaker to use QE improves the stability of the economy, relative to the case in which QE is not used. With ‘active’ use of QE, the output gap is closer to zero and inflation closer to target, on average. Moreover, on average, active QE implies that long-term bond yields are lower than in the absence of QE. These observations suggest that a policy framework in which the central bank permanently holds a large quantity of long-term government bonds on its balance sheet – ‘permanent QE’ – may be a way to improve average economic outcomes. Such a policy might reduce average long-term yields so that the short-term policy rate required to hit the inflation target is higher. And a higher average short-term rate would reduce the frequency with which the short-term policy rate hits its lower bound. In fact, this logic does not hold in the simple model used in the paper. ‘Active’ QE improves welfare precisely because it is active. It works through an expectations channel: bond holders recognise that the central bank will activate QE if and when the short-term rate hits its lower bound. If the central bank merely holds a fixed proportion of long-term debt on its balance sheet, then it will not replicate this feature of an active QE policy. Though the model does not support the idea that central banks should maintain permanently large balance sheets, it does suggest that we may see more quantitative easing in the future. If real interest rates remain low for a prolonged period, perhaps because of secular factors, then we would expect the lower bound on policy rates to be encountered more often. During these more frequent lower bound episodes, the model predicts that QE should be used to help support spending and inflation. Richard Harrison works in the Bank’s Monetary Assessment and Strategy Division. Previous Post Is the economy suffering from the crisis of attention? Gradual QE unwinding assumes that central banks can perfectly control portfolio balance over time, hence, central banks must perfectly anticipate demand and supply curves in order to control imbalances that ultimately arise when rewarding bad behavior. When in the history of the human race has any bank been able to assume perfect control and maintain solvency while rewarding bad behavior? The answer is NEVER! The arrogance of current economic science is astounding! Pandora’s box has been opened my fellow investigators. Human arrogance regarding our ability to control our environments is not being measured in your models. The bond market, the true engine of any social economy, is so polluted and unmeasured, that true risk measures cannot be parameterized, let alone controlled. Risks, unbridled, can only lead to the unleashing of fear. That fear has only been rising, at least in this investigator. As figure 2 shows the “stance” of QE – defined as asset purchases as share of long-term government debt – loosened from Aug 2016, and is now near neutral. That is not consistent with result 3 – that QE policy should tighten before Bank Rate lifts-off. Isn’t the implication that the current MPC guidance on QE, with no unwind until Bank Rate is around 2%, is incompatible with the results of Richard Harrison’s (sophisticated) model?